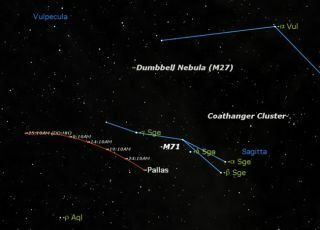 The giant asteroid Pallas reaches opposition on Friday July 29, 2011, in the tiny but interesting constellation of Sagitta, the arrow, right in the middle of the summer triangle, Vega, Deneb, and Altair. This week, skywatchers equipped with telescopes have a good chance to observe the huge asteroid Pallas as it reaches opposition on July 29. Despite its size, the 326-mile (524-kilometer) wide Pallas is still too small and far away to be visible with the naked eye. But it is readily visible in binoculars and small telescopes as it sails westward across the tiny constellation of Sagitta, the arrow. Sagitta has no bright stars, but is easily visible in a dark sky with the naked eye, or with binoculars in the city. It is very easy to locate, right at the center of the "summer triangle" formed by the three bright stars Vega (in Lyra), Deneb (in Cygnus) and Altair (in Aquila). In the sky map of Pallas available here, the dots indicate positions of the huge asteroid five days apart. As you can see, it’s a fast mover. Try to sketch the stars in its vicinity and look for the one that moves from one night to the next: that will be Pallas. While looking at Sagitta with binoculars, be sure to check out the two fine deep sky objects in its close neighbor Vulpecula, the Little Fox. The Coathanger Cluster looks like its name suggests: an upside down coat hanger. The Dumbbell Nebula is the brightest and among the largest of the planetary nebulae: puffs of gas given off by dying stars. It’s small but easily visible in binoculars, and a real treat in any telescope. Sagitta itself is the home to a nice little globular cluster, Messier 71. Because of its small size, this cluster is best appreciated in large amateur telescopes, but still is an interesting find for any stargazer. The moon and Mars are also offering up good views this week. On Wednesday morning before dawn the moon and Mars will be visible together. Even in the middle of July 2011, the winter constellations dominate the sky an hour before dawn. On Wednesday morning, the moon meets Mars in the constellation Taurus. Mars and the moon currently appear against a background of what we usually think of as winter constellations: Auriga, Taurus, Orion, and Gemini. It’s an open secret among astronomers that you can get the jump on the seasons by staying up late. So early risers can observe the most beautiful winter objects in warm summer temperatures rather than in the middle of freezing winter. While observing Mars and the moon, be sure to take in the Pleiades star cluster and the Crab Nebula, two of the best known deep sky objects in the constellation Taurus. The moon will be moving on, but these "winter" objects will be there all summer for early risers.